Sound "The C3.0's tweeter followed its own path, displaying lavish high-frequency detail amidst an overall sugary character." The bass had "depth...and...inherent tightness, those three small woofers indeed producing the low frequencies of a single larger woofer and also providing the agility to impart copious bass detail." "Amidst that sweet treble and surprising bass, the midrange is less distinguished, a glass of water in between wines of good vintage. This is where the neutrality of the Ayra C3.0 is most obvious -- there's nothing that sticks out other than the fact that nothing sticks out." In the end, these speakers offer "sweetness and light, instead of austerity and analysis." "I liked what I heard right from the start." Features "Central to the Ayra C3.0 is a trio of drivers that are unique to Raidho. The self-contained ribbon tweeter...uses a 3" x 1 1/2" membrane that weighs less than two hundredths of a gram." " The Ayra C3.0's other drivers -- a single 4" midrange and three 4 1/2" woofers -- use very rigid cones to aid in achieving true pistonic movement. Dubbed Ceramix, the cones are actually a composite of an aluminum substrate with an aluminum oxide layer. The aluminum oxide is formed in a process where high voltage and high current are used to create a high-temperature environment in which the aluminum oxide gradually forms on the aluminum core." "The Ayra C3.0's cabinet is a melange of materials, including MDF, aluminum and a plastic-like composite material. The cabinet has no front baffle per se; instead, each driver is attached to a machined-aluminum plate that is then affixed to the speaker cabinet." Use "Toe-in proved to be the most critical setup parameter, with the speakers sounding too mellow fired straight ahead but gaining high-frequency sparkle and transient speed as they were pointed more toward the listening seat. Ultimately, their output met right at the sweet spot." "The speakers ship with no grilles -- or provision for using them." Value "On paper, the C3.0s seem pricey, but when you consider their form-as-function design and custom esoteric drivers, they fall in line with the speakers in their price range, and they offer a few things sonically that others don't." Denmark is home to a bustling high-end-audio industry, the cornerstone of which is a true loudspeaker giant, Dynaudio. The name of this company, founded more than 30 years ago, transcends its own speakers, given the many models in which Dynaudio drivers are used around the world. Unfortunately, if you're located in Denmark and you plan to make speakers, you have to be resigned to living in the shadow of the giant unless you set out on a path that's completely your own, eschewing not only the use of Dynaudio drivers in your speakers but any other company's as well. This is just what the people at Raidho have done, creating speakers that mate ribbon tweeters with esoteric cone drivers completely of their own design and manufacture. The C3.0 is currently the largest floorstanding speaker in Raidho's new Ayra line, which is above the company's well-established Eben line. When the Ayra C4.0 and C5.0 eventually materialize, however, the C3.0 will take its rightful place as a middle child. I first heard the Ayra speakers when, the night before CEDIA began, I visited Brian Ackerman of Aaudio Imports, the North American distributor for Raidho products and a number of other European and Asian brands. The bottom floor of Brian's custom-built house is home to his business and absolutely packed with speakers and electronics. His large listening room, heavily treated with spiky Golden Acoustics panels to tame room issues, has complete systems at each end, one of which featured Raidho Ayra C1.0 speakers on some funky matching stands. Fronted by a Lindemann amp, preamp and CD/SACD player, these speakers sounded spacious and more authoritative than they should have given their size. Right there and then, Brian and I discussed a review, and the larger C3.0s were on their way to me a month later. "Ask and ye shall receive," as the Good Book says. Central to the Ayra C3.0 ($36,000 per pair) is a trio of drivers that are unique to Raidho. The self-contained ribbon tweeter (stock number FTT75-30-8, in case you're interested) uses a 3" x 1 1/2" membrane that weighs less than two hundredths of a gram. Ribbon tweeters need strong magnetic fields, and Raidho uses an array of neodymium magnets to provide this. The sonic advantage of a ribbon tweeter comes from the lightness of the membrane, which makes for low resonance, fast acceleration, and extended frequency response. But all of this comes at a price. While ribbon tweeters offer good horizontal dispersion, their vertical dispersion is narrow, which you'll hear when you stand up after a seated listening session. This can be overcome in a couple of obvious ways: using a very long ribbon tweeter, � la Magnepan, or a series of shorter ribbon tweeters mounted one above the next to create the sonic footprint of a long driver. The Ayra C3.0 uses a single shorter tweeter that is said to offer better-than-usual vertical dispersion. Still, the C3.0 is a speaker made for seated listening. The Ayra C3.0's other drivers -- a single 4" midrange and three 4 1/2" woofers -- use very rigid cones to aid in achieving true pistonic movement. Dubbed Ceramix, the cones are actually a composite of an aluminum substrate with an aluminum oxide layer. The aluminum oxide is formed in a process where high voltage and high current are used to create a high-temperature environment in which the aluminum oxide gradually forms on the aluminum core. More than 60 hours of this treatment are required to create the 150-micron oxide layer of the Ceramix cone. As with the ribbon tweeter, the Ceramix driver's motor system uses neodymium magnets, though two layers in a push-pull configuration to aid in achieving the driver's goal of pistonic action. The tweeter's operational range is 2kHz to 50kHz, and it crosses over to the midrange driver mounted above it at 3kHz. This covers the range down to 150Hz, where the trio of woofers takes over. Quoted frequency response for the Ayra C3.0 is 30Hz to 50kHz, with impedance given as 6 ohms and sensitivity as 89dB/2.83V/m. Brian Ackerman recommends at least 50Wpc to drive the Ayra C3.0s, but, as you'll read, these speakers can really soak up amplifier power. The Ayra C3.0's cabinet is a melange of materials, including MDF, aluminum and a plastic-like composite material. The cabinet has no front baffle per se; instead, each driver is attached to a machined-aluminum plate that is then affixed to the speaker cabinet. The front of the speaker gently curves, with the midrange at the top and the bottom woofer sitting the farthest forward. Each of the drivers is vented at the rear, the back panel being another slab of machined aluminum. These disparate materials form a well-damped whole that weighs 154 pounds. The Ayra C3.0 measures 52" high and 20 1/2" deep but a mere 7 7/8" wide, requiring the use of included outrigger stands for added stability. 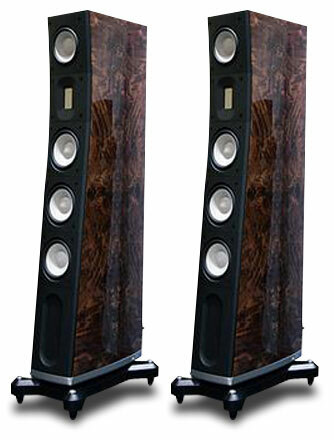 The standard finishes are piano black lacquer and glossy walnut-burl veneer, but Raidho will also paint the speakers any color a potential owner wishes. The speakers ship with no grilles -- or provision for using them. There is a single set of binding posts. Maybe I've become spoiled by the fact that so many of the speakers I write about are set up in my room by their makers, but I found the Ayra C3.0s moderately difficult to fine-tune. Oh, you can place them just about anywhere and they will sound acceptable, even very good, but reviewing speakers requires that you do the work to get the best sound from them, and that requires moving them around the room, sometimes mere fractions of an inch. This is also a useful exercise for understanding the capabilities of a speaker. You discover much about the bass by moving speakers toward and away from room boundaries, and you hear how their ability to cast a soundstage changes by moving them closer to and farther from each other. You can hear how reflections change through toe-in, and you come to understand the way in which all of this affects the ultimate performance of the speakers in your room. Back to my main point: I moved the Ayra C3.0s around my room quite a bit before I settled on spots that seemed to unveil their capabilities to the fullest. This put the speakers exactly 58 1/2" from the side walls and 61 1/8" from the front wall (to the back of the cabinet, that is) of my large -- 29'L x 20'W x 10'H -- room. The speakers were 9' 8" apart, measured center to center. Toe-in proved to be the most critical setup parameter, with the speakers sounding too mellow fired straight ahead but gaining high-frequency sparkle and transient speed as they were pointed toward the listening seat. Ultimately, their output met right at the sweet spot. All of this led to the best tonal balance -- neither warm nor cool -- the widest and deepest soundstage, the best combination of bass weight and tightness, and the sense that the drivers' output was summing at the listening position. I could go into great detail about the wrong things to do when positioning the Ayra C3.0s, but who needs to know all of that? Amplifier power was also an issue with the Ayra C3.0s. While they functioned with the 110Wpc Audio Research Reference 110, they responded better to the 150 watts that the Convergent Audio Technology JL3 Signature Mk 2 monoblocks could deliver, and they liked even more the 200Wpc of the Lindemann 855 stereo amp, a late addition and a model that Brian Ackerman also distributes. As power output increased, so did the speakers' openness, soundstaging prowess and low-end authority, though I'm sure the switch from tubes to solid state had a hand in this as well. Preamps were a CAT SL1 Legend with built-in phono, an Audio Research Reference 3 line stage, and an Aurum Acoustics CDP with phono, which also plays CDs. Digital gear included the Aurum CDP, an Ayre C-5xe universal player, and the Zanden Model 2000P/Model 5000S transport/DAC combo. Analog playback came via a TW-Acustic Raven AC turntable with Graham Phantom B-44 and Tri-Planar Mk VII UII tonearms, on which were mounted Dynavector XV-1s stereo and mono cartridges. Phono stages were an Audio Research PH7, a Lamm LP2 Deluxe and the Aurum CDP's highly flexible internal unit. Phono cables were an AudioQuest LeoPard and the one that is integral to the Tri-Planar tonearm. A Shunyata Research Hydra V-Ray and a number of Shunyata Anaconda and Python power cords -- both Alpha and Vx versions -- handled power duties, alternating with an Essential Sound Products Essence Reference power distributor and a number of Essence Reference power cords. Interconnects and speaker cables were AudioQuest William E. Low Signature along with Shunyata Research's new Aurora-IC interconnects and Aurora-SP speaker cables. The pair of Ayra C3.0s that came to me were off-the-boat new. Once positioned, they sounded very good even with minimal post-manufacture playing time. Still, I hammered them with music for more than a week before sitting down to form opinions. Afterwards, I thought they sounded a little more supple and liquid, although I had been hearing them in the background for ten days, so I'm sure I had become accustomed to their sound. What I'm getting at is this: The Ayra C3.0s may or may not benefit from lengthy break-in, but giving them a hundred hours certainly won't hurt. Picking the right amp for use with them is far more important. I've had firsthand experience with Magnepan and Verity Audio speakers that both use exceptional ribbon tweeters, and plenty of experience at shows with other speakers whose ribbon tweeters leave something to be desired. All of this set a few sonic images in my mind -- things I expected to hear from the Ayra C3.0s. Foremost was some of the most delicate high-frequency detail possible, perhaps accompanied by a splashiness and glare that caused the treble to border on brightness. I was surprised, then, when the C3.0's tweeter followed its own path, displaying lavish high-frequency detail amidst an overall sugary character. This tweeter didn't sound like a dome, either aluminum or fabric, but it also didn't sound quite like the other ribbon tweeters I've heard either. It grounded the personality of the C3.0 in sweetness and light, instead of austerity and analysis. I liked what I heard right from the start. If you are at all familiar with Blue Note's RVG series of remastered classic jazz titles, you have an idea of what I mean by "austerity and analysis." These CDs are successful in the sense that they offer music that has by now, 40 or 50 years later, withstood the test of time and can be called classic. Sonically, however, they come up short, sounding lean and unnaturally crisp. They present music you'll listen to because of what it is, even as you wish the digital sound was more like analog. I played a number of these CDs with the Ayra C3.0s precisely because the speakers didn't exacerbate the intrinsic sonic issues and ultimately helped them sound pleasant in ways they wouldn't through ruthless speakers. The difference is important if you care about music and not merely about sound, the Ayra C3.0s turning the title cut from Art Blakey & the Jazz Messengers A Night in Tunisia (Blue Note 7243 8 64474 2 5) from aggressive din into something more like what happens with the exceptional Music Matters LP of the same recording: a propulsive, sweat-soaked workout that shows an important jazz ensemble at the apex of its powers. I am not implying with this that the Ayra C3.0s sound subdued, shelved down or contoured. Instead, they do not sound like they are so married to the notion of neutrality �ber alles that they will sacrifice the simple pleasure of listeners to a supposed higher ideal. If you listen to an exceptional-sounding recording with these speakers, like the CD of Greg Brown's probing The Poet Game (Red House RHR CD 68), you'll hear it in all its sonic glory, but you won't be forced to play only exceptional-sounding recordings. I've owned the late Chris Whitley's Din of Ecstasy (Work CK 53970) on CD since its release. It's an oddball in Whitley's recorded output, which leans toward stark, raw blues instead of the electrified noise on this recording. The Ayra C3.0s don't prettify the searing, grating guitars; you understand that the "din" of the title is literally true about the music. But the abrasive distortion, crisp to the point of harshness, doesn't take over and send you running to turn the music down. I cranked Din, awash in the noise. It was great -- music at its rude, ugly best. Din of Ecstasy also underscored the depth of the C3.0's bass and its inherent tightness, those three small woofers indeed producing the low frequencies of a single larger woofer and also providing the agility to impart copious bass detail. This was a surprise -- that a medium-sized speaker with such a narrow footprint could deliver deep bass without obvious deficiencies. Of course, if I compared the C3.0's bass to that of some of the behemoth speakers I've reviewed, it comes up short in some obvious ways, but there is nothing about this speaker that will start you thinking about the "s" word and the resulting ding to your system budget. To put this to rest, I played one of my bass faves, Tracy Chapman's "3000 Miles" from the Where You Live CD (Elektra 83803-2). The deep, throbbing bass tones were there, rumbling and surely sending poofs of air through the speakers' ports. It's all a matter of degree. If you hear the Ayra C3.0s alongside a pair of Wilson MAXX 2s, for instance, you will notice that those throbs have more thumping power and greater depth from the much larger Wilson speakers, but when you hear them over the Ayra C3.0s in isolation, you'll likely think, as I did, "Whoa! Impressive." Perhaps there is something to Raidho's goal of pistonic action for its cone drivers. I certainly wouldn't argue about the speaker's performance down low, though I would pick a nit higher up. Amidst that sweet treble and surprising bass, the midrange is less distinguished, a glass of water in between wines of good vintage. This is where the neutrality of the Ayra C3.0 is most obvious -- there's nothing that sticks out other than the fact that nothing sticks out. This can make some midrange-centric music sound unexciting, though I suspect that listeners will have a hard time identifying what the issue is, so even-handed is the C3.0 through this region. Again Tracy Chapman, this time her eponymous debut album on LP (Elektra 607741). The a capella "Behind the Wall" had everything going for it, including the unadorned quality of the C3.0s through the midrange, but I wished for more body, a corporeal presence that would come within a hair's breadth of putting Chapman in the room with me. It can happen with this track, and the Ayra C3.0s achieved it to some degree with the sheer vividness of the vocal, but Chapman remained at arm's length instead of transcending the playback hardware. No matter -- I still loved the tangy sweetness of the treble and the suppleness of the bass. Nothing can take those away from me. This track also showed how well the Ayra C3.0s can anchor images in a soundstage, Chapman's voice locked right where my equipment rack sits in unwavering fashion. The Tri-Planar tonearm helped here, the speakers passing on the strong outlines and spatial aura that are two of this tonearm's strengths. Give the Raidho speakers something more challenging, such as an early stereo jazz recording like the LP of Anita O'Day at Mr. Kelly's (Verve UMV 2550), and they shuffle the sonic deck, placing singer and band hard left and hard right respectively, again with no doubt as to where each should be, given the recording. Like most speakers with narrow fronts, the Ayra C3.0s disappear once they've been dialed in, an illusion that's harder to pull off when there are seemingly only musical elements in the left and right channels and nothing in between. Still, they did it with ...at Mr. Kelly's, about as difficult a recording for this as exists. Overall, the Ayra C3.0s meshed well with some of what's on my personal speaker wish list: sweet treble that's highly detailed and never cloying, nimble bass that shows obvious depth, and the ability to disappear and leave music behind. On paper, the C3.0s seem pricey, but when you consider their form-as-function design and custom esoteric drivers, they fall in line with the speakers in their price range, and they offer a few things sonically that others don't. Ultimately your ears will tell you if the Ayra C3.0s are right or not, and they may do this more readily than with other speakers because of the C3.0s' listener-friendly character. I have been living with Wilson Audio MAXX 2 speakers ($48,900 per pair when still available) since I reviewed them shortly after their introduction in 2004. The MAXX 3 ($68,500 per pair) was announced a few months ago, but this diminishes the previous version of the speaker not a bit. Even if the MAXX 3 is significantly better, the MAXX 2 is still wonderful, offering authoritative, full-range sound in a package that's sympathetic to low- and high-power amps alike. My only regret over the past four years is that reviewing duties have too often relegated the MAXX 2s to an out-of-the-way spot in the bedroom instead of center stage in the listening room. There are some obvious differences between the Ayra C3.0 and MAXX 2 -- physical size, driver configuration, sensitivity, claimed bandwidth and price -- and these will point the speakers toward different owners. Still, it's informative to understand how these speakers compare to each other, discerning their similarities as well as their differences. I've always found the MAXX 2s engaging with all kinds of music; they are universal in this sense, not limited to or best with acoustic jazz or electrified rock. Ditto the Ayra 3.0. While I began my listening to these speakers with a steady diet of jazz and thought they favored it, as I began playing rock and classical and folk and even electronica, the speakers reproduced it all with the same character, impressing equally with delicate plucked strings or thumping electric bass lines. The MAXX 2s can definitely play louder with less power, as few at 20 watts, while the Ayra 3.0s sound their best with lots of power behind them, and then even more if you have it. The Lindemann 855 proved to be a terrific match for the speakers in this regard, its clean-as-mountain-air sound locking in with the speakers. Through the mids the MAXX 2s have the fullness and rounded presence that I'd love to hear some of from the Ayra C3.0s, while up at the very top of the range, the Raidho speakers differentiate overtones better, conveying hall ambience in a more conspicuous way. The MAXX 2s' way with ambience seems different -- not as wispy -- perhaps because of its greater presence. In the bass, this is really a battle of brute power versus athletic agility, with the MAXX 2s able to pound out bass notes while never glossing over any detail or dynamic gradation, while the Ayra C3.0s offer surprising depth along with obvious tautness. The Wilson speakers are champs at large swings in dynamic range, the ability to portray physical size either very large or very small, along with power and dynamic gradations in the bass, all amidst a fundamentally physical portrayal of the music that's abundant with meaningful detail. In comparison, the Raidho speakers seem to convey space in a more obvious fashion, filling it in with musicians whose playing is captured with acute detail and an endearing touch of treble sweetness. I prefer the MAXX 2s, especially given the wide range of amps I can use with them, but I certainly valued my time with the Ayra C3.0s, enough that I look forward to hearing their bigger brothers. There truly is a world of audio available, with no country able to claim dominance in terms of innovative thinking or sonic acuity. Denmark has a population around 5.5 million and at least two distinguished speaker manufacturers. The C3.0 is an impressive center point for Raidho's Ayra line. Its uppermost treble sparkle and bit o' honey along with keen soundstaging and bass that's both deep and athletic make it one of the important speakers to hear in its price range. This is especially true for people who prefer big solid-state muscle, as this speaker can make good use of whatever power you can allot it. It is a speaker that always makes music, eschewing the notion that the best speaker is the one that sounds the most like a scientific instrument. While some bigger speakers will improve upon its ability to portray large-scale works with something approaching realism, the Ayra C4.0 and C5.0 are in the works and may prove to be worthy of consideration among the world's best. While all of the design touches make the Raidho Ayra C3.0 a unique speaker, its sound transforms it into something more than a mere curiosity. I'll miss it. Price: $36,000 USD per pair. Warranty: Five year parts and labor.